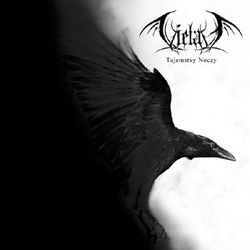 Atmospheric pagan black metal band Vietah from Belarus released its third full-length album “Tajemstvy Noczy” in the beginning of 2014. Vietah (old moon in Belarusian) is the solo project of Antarktys from Гомель (Gomel) since 2006. The band released its debut album “Zorny Maroz” in 2008 and the second one “Smalisty žah” in 2010, both via the Russian label Stygian Crypt Productions. Their new album comes as cooperation between Stygian Crypt Productions and Possession Productions. “Tajemstvy Noczy” includes 4 long songs, each one lasting around 10 minutes. Compared to the previous albums, this new work has a much more straightforward black metal approach. The synth-based songs of the debut album and the more epic mood of the second work, have given their place to a clearly purer colder black metal sound. Guitars are now totally dominating their orchestrations, with a better production and a more powerful natural sound. Keyboards are totally absent this time, while Antarktys’ screaming vocals sound more passionate and hateful than ever. Their music has a bleak somber melancholic atmosphere, dressing perfectly their autumnal and winter themes. It retains its melodic pagan black metal aura and at the same time it is more aggressive and direct. The four songs are based on the wonderful rhythmic sessions of the guitars that create an almost suffocating atmosphere, leaving only few moments of warmth and hope survive. Despite the long duration and rhythmic nature of their songs, Vietah avoid repetition by using several melodic variations on their riffs. All their lyrics are in their native language and you can find them in the CD booklet. Vietah have offered us another quality album that will please their fans and might attract new listeners with its more powerful and austere pagan black metal sound. “Tajemstvy Noczy” is released by Possession Productions and Stygian Crypt Productions in a standard jewel-case CD edition with 16-page booklet, including beautiful nature photography by Rygorycz de Slaven. Vietah will release on January 2015 their fourth full-length album “Czornaja Cvil” again via these 2 labels. On December 4th, 2014 they also released digitally a joint work with the experimental Belarusian black metallers Door into Emptiness, entitled “Kali b my mahli bačyć usie zorki, načnoje nieba było b śviatłom”. It is a 20-minute instrumental experimental post rock track, quite different from what the band has released so far, but very interesting too! You can visit their official pages below for more info and to listen to their complete discography.